Bob Allan began his relationship with the Maritime Museum in 1989 and is still showing up to offer his expertise, talent and support 26 years later. As a volunteer, member, and Heritage Society donor, we can't thank him enough for all he has done and continues to do for the Museum. If you have been on the Berkeley, you should know that Bob helps maintain the Berkeley's 1898 steam engine to ensure the safety and comfort of visitors. He is also involved in the annual Festival of Sail and other activities, stepping up to help however he can. 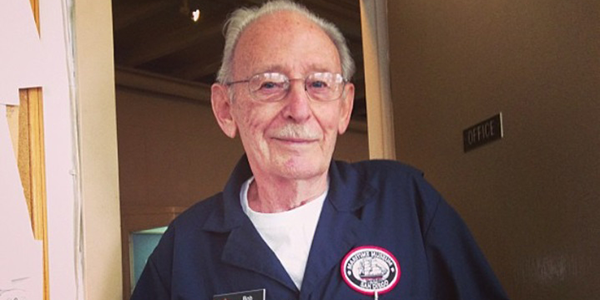 At this point, Bob has logged over 10,000 hours as a volunteer of the Museum - an amazing feat! His wife, Dixie, who passed away in 2013, was also an avid supporter of the Museum volunteering a total of 5,000 hours during her lifetime. Together they enjoyed helping with many events and activities including Movies before the Mast and Halloween extravaganzas. Bob says that what he likes most about the Museum is "the people that keep it afloat". We agree. Bob's advice for the younger generation is to "get a good education, do your part to get the country back on the right track, and find time to volunteer at any age". We echo his advice and appreciate that he and Dixie chose the Maritime Museum of San Diego as a charity worthy of their time, talent, and commitment. In 2005, Bob & Dixie became Heritage Society member by setting up a deferred gift annuity through the Museum to benefit their daughter, Cynthia (Tina). The program was a good fit for what they wanted to accomplish and also provided them with a significant income tax deduction to help lower their tax bill. They appreciated the fact that the gift annuity would provide income for Tina at retirement and also embraced the concept that it would ultimately help support the Museum. Click here for further information on charitable gift annuities or call Jeff Levenson at (619) 234-9153, extension 141 to request a complimentary illustration of how a charitable gift annuity might benefit you and your family.